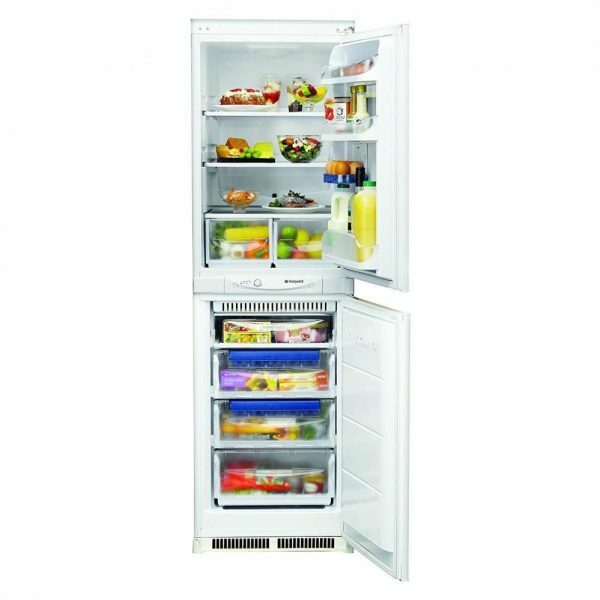 A great solution to your cooling needs, the Aquarius Built-In Fridge Freezer from Hotpoint will bring together superior storage and a wealth of tech for keeping your food exceptionally fresh. With 225L of capacity within the refrigerator, there is plenty of space for the weekly food shop making it a model particularly ideal for larger families. Featuring Hygiene+ Protection, a special anti-bacterial coating on the cavity walls will kill bacteria and mould spores so fresh produce is kept in an ideal climate to maintain its freshness and natural flavour. With two glass shelves to store your cheeses, meats, milk and butters, the two dedicated salad bins are perfectly designed to keep veggies and salad crisp, and fruits full of flavour and blush. Complementing the exceptional cooling space is 148L of freezing capacity distributed across four deep, clear-fronted drawers. Room enough for all the essentials, plus sweet treats, this model also features Ice Care a common sense approach to ice trays which sets them neatly inside the drawers for space efficiency.